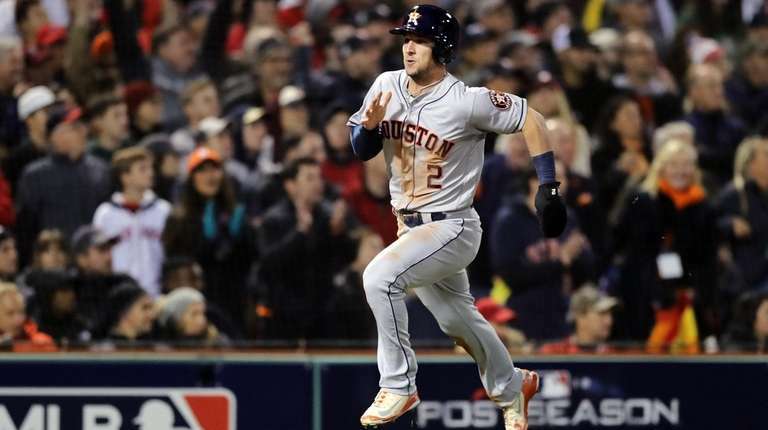 Third baseman's brilliant fielding helped Houston win Game 1 of the ALCS against the Red Sox. BOSTON — Alex Bregman didn’t have a hit in Game 1 of the American League Championship Series. Yet by a large margin, the third baseman was the MIP (Most Impactful Player) of the Astros’ 7-2 victory over the Red Sox on Saturday night at Fenway Park. Bregman went 0-for-1 but reached base four times — three walks and a hit by pitch — and scored two runs. His importance, however, showed most in the field. Bregman, a standout defender as well as a force on offense, recorded seven assists, and few would have been described as routine. Bregman’s work included a throw home to Martin Maldonado in the fifth inning to save a run. It was especially noticeable on a night when Red Sox third baseman Eduardo Nuñez had his problems. Nuñez couldn’t come up with George Springer’s ground smash that went for a two-run single in the second inning, and he committed an error in the sixth that led to Carlos Correa’s two-out RBI single that gave Houston a 3-2 lead. Yankees fans are all too familiar with the frustration Red Sox fans must have felt watching Bregman’s display. In the Astros’ 4-0 victory over the Yankees in ALCS Game 7 last year, Bregman made the game’s most important defensive play. After fielding Todd Frazier’s slow chopper with runners at first and third and one out in the fifth inning, Bregman’s risky throw nipped Greg Bird at the plate to preserve Houston’s 1-0 lead. Reddick said that with a smile, hitting on Bregman’s overall popularity in the clubhouse. The 24-year-old took Spanish while growing up in Albuquerque, New Mexico, and has continued to make an effort to learn the language so he can communicate better with his Latino teammates. Bregman hit .286 with 31 homers and 103 RBIs and posted a .926 OPS in the regular season. He entered Sunday night 5-for-10 with two homers, a double and seven walks in this postseason. Underneath it all is a gym rat. Jeff Luhnow, who has been the Astros’ general manager since December 2011, pulled the trigger on drafting Bregman second overall out of LSU in 2015.